I originally intended to go through my back issues of Threads magazine in chronological order, and choose a project fromm each. I’ve already skipped one though, and now I’ve given up on that idea and am going through them reasonably randomly. The main reason is that the next project I found would have been perfect for something I’ve already started. When I went to find said half-finished project though, I could only find some of it, and not the rest. So, no finishing that, not now anyway. I wasn’t going to start another project to use the same technique, so I moved on to a different issue. This is from the very first issue of the magazine I ever bought, number 65 from July 1996. Really, this is cheating, since I started to make this project over a year ago, and had just never finished it. 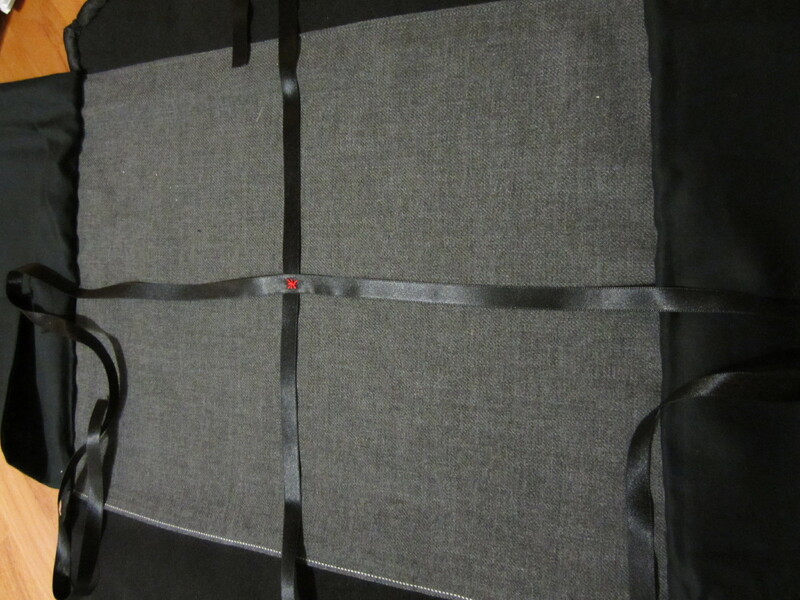 All I had to do was get it out of the cupboard, sew on some ribbon ties, and a fastening, and it was done! Still, extra kudos for having ticked a UFO off the list I reckon. I was having a rather Art Deco phase when I did this, but I quite like it. This is the back. I’d really like to think that one day I will have written a book, and will be going to meet a publisher with the first draft safely tucked away in this portfolio. Realistically though, even if I do ever write a book, I’m far more likely these days to submit it online than in a portfolio, however arty and creative one might be! Also, one of these days I might figure out how WordPress decides where to put photos. Try as I might it’s still hit and miss as to whether the photos end up where I want them on the page, and in relation to the right bit of the text. Seems to have a mind of its own somehow. Now to find the next issue of Threads, and the next project! 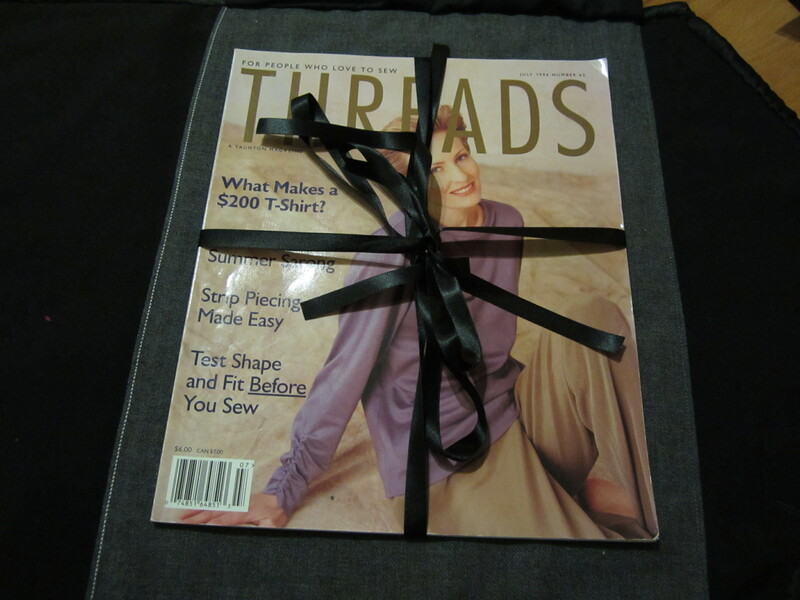 I’m continuing my self-set challenge to make something inspired by every issue of Threads magazine I own. I originally intended to take them in chronological order, but I must admit here to skipping a couple of issues already. 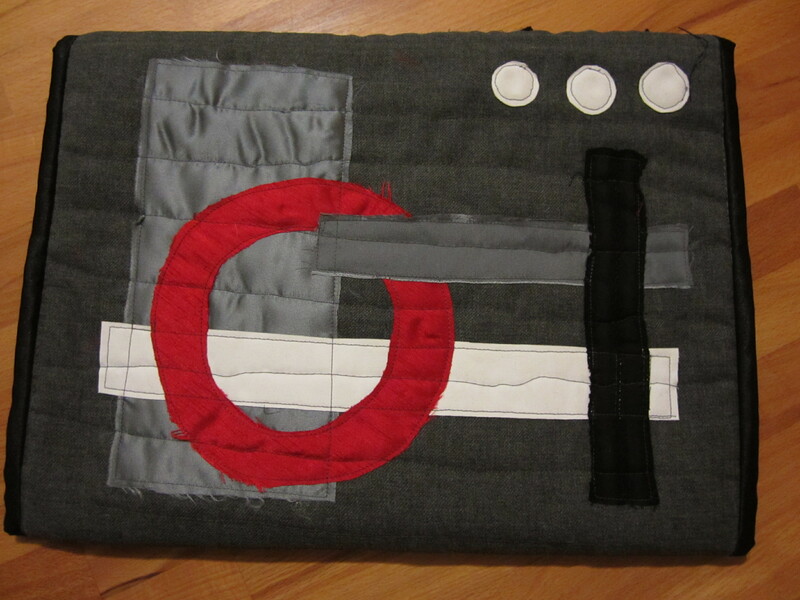 There were (are) projects I could do in them, but they were more time-consuming than I’m looking for right now. Quick and dirty is the answer at the moment. So I’ve moved on to Issue number 62, from January 1996. 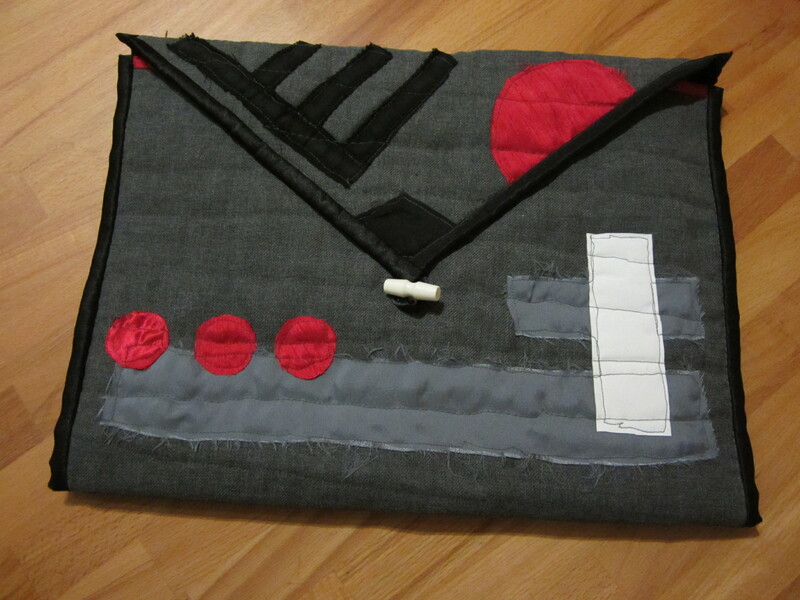 Here I found a design for an apron, and since I don’t possess an apron that seemed like a reasonable project. Also, I’m going to a fabric painting/printing workshop next weekend, and an apron is on the list of supplies to take. Normally I just tend to wear old clothes and accept that they get dirty or painted or whatever, but an apron is probably a good idea. I also intended to use as much as possible out of my stash for these projects, but in the interest of speed I did buy supplies for this project. 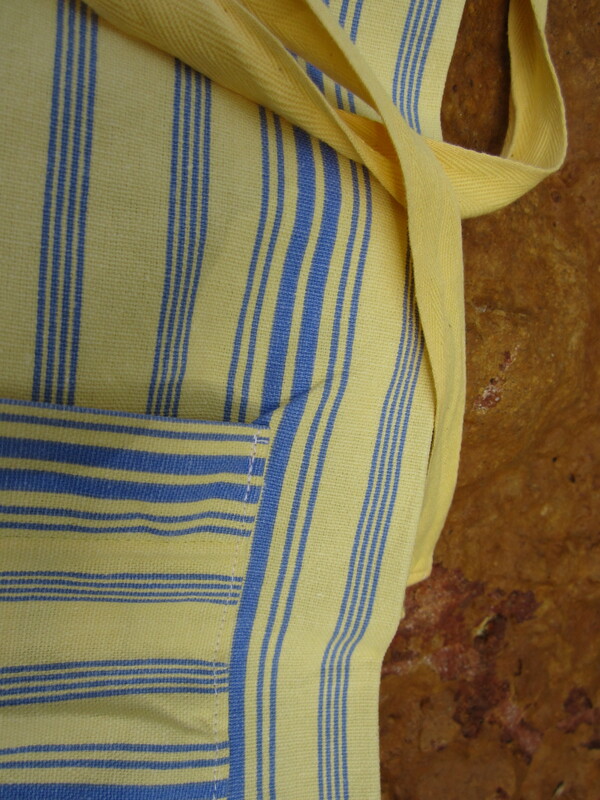 A stripey blue and yellow heavy cotton, and some yellow twill tape. I thought of using some print scraps for the pockets, but decided to stick to the one fabric. Here is the result. top for glasses, and a small pocket on the side for a pencil, along with three other pockets. There is also something which I couldn’t at first understand. 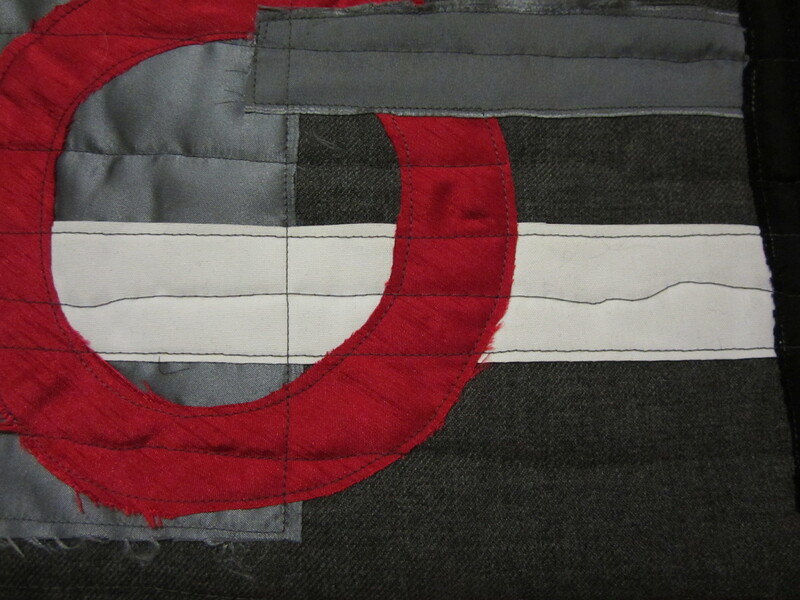 The article suggests a piece of twill tape along the inner hem of the apron, to make what it calls another large pocket. This puzzled me, how can this be a pocket, but then I figured out that you can take hold of the piece of tape and lift the hem of the apron so that you can carry things in it. Like the archetypal farmer’s wife collecting eggs from the hens, or apples from the orchard. Not sure how often I’ll use that feature, but I’ve included it anyway. Just forgot to take a picture, so you might have to imagine it for now. I’m also unsure about the fact that the apron is made from a double layer of fabric, as suggested in the article. It saves some hemming etc, but I’m worried it might be too hot now that summer is coming here in Australia. 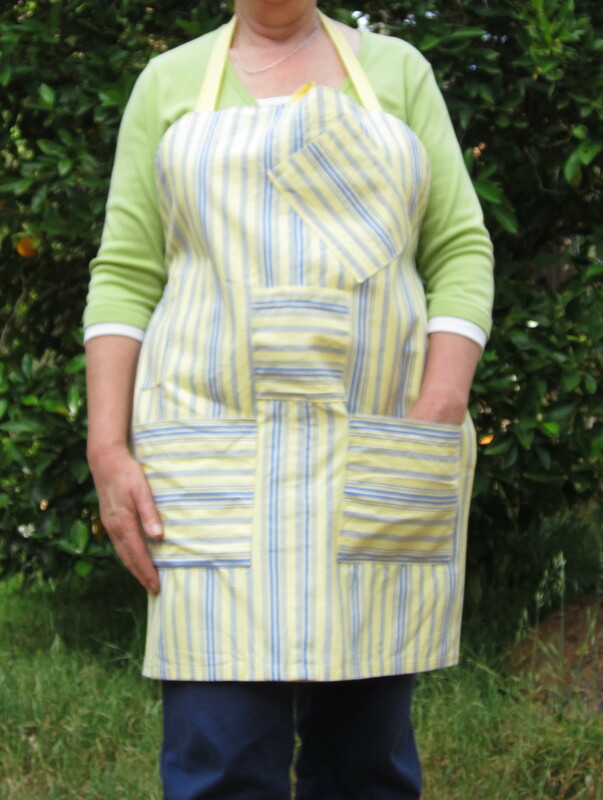 Perhaps another apron needs to be on the to-do list. I’ve decided to give my challenge a title, in common with all the best blog challenges, Me Made March, Self Sewn September etc. Mine is ‘Threads magazine – Inspiration in every Issue. I’m already looking into the next issue to decide on a project. I think I might be able to get extra kudos, since I can possibly use this to finish an existing UFO – double whammy!